The all new X4⁰ will be the smallest model in the pure X range; blending quality, performance and styling with cruising capability. Hot out of the X-Yachts Design Office comes the X4⁰, a forty-foot performance cruising yacht that is just as capable for some serious mileage as it is blasting around the cans at the weekend. The new baby X-Yacht joins the hugely successful and critically acclaimed pure X range. 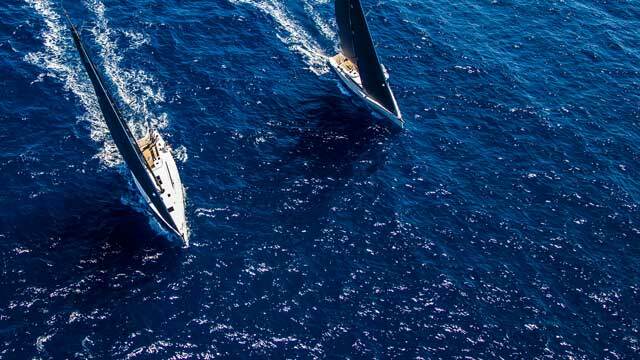 The design philosophy was very clear from the outset - like all our yachts, we place a huge emphasis on giving the owner a superb and comfortable sailing experience, on a yacht that is easy to handle by all the crew. The X4⁰ is currently under full development and is expected to launch early Summer 2019 for sea trials and testing. What a way to celebrate X-Yachts’ 40th Anniversary! With the introduction of the X-65 in 2007, X-Yachts started to infuse hulls for performance yachts utilising epoxy resin. Epoxy infusion construction offers fantastic control over the laminate allowing it to be optimised to maximise strength and stiffness, whilst saving weight. In the X4⁰ all weight saved is used to increase the yacht’s stability enabling the crew to have a more relaxed time and to feel safer and more comfortable. The fact, that the hull is cured, baked at high temperatures for almost 24 hours, not only optimises the hull material properties but also minimises the risk of the darker coloured hull surfaces to suddenly start posturing, losing the surface finish. With over 10 years of experience building epoxy infused yachts, X-Yachts took the decision in 2018 to build all models using this technology, one of the only yacht builders to do so. At the heart of the X4⁰ is the galvanised steel keel grillage structure. Pioneered by X-Yachts back in 1981, the galvanised steel hull girder offers superb reassurance and safety. Its primary role is to spread keel and mast loads into the hull and it also enables the yacht to withstand extreme shock loads from grounding or an impact with a submersed object. Not only is the keel structure immensely strong, it is also reliable and very easy to inspect for potential damage. Bolted to the steel grillage is the keel with iron fin and heavy lead bulb with moderate draft. There is both a shallow and a deep draft option available. The standard deck layout comes with: 4 winches, two halyards, self-tacker sheet and control line winches next to the entrance, and two main sheet winches aft of the cockpit’s backrest coamings within reach of the helmsman. The deck has an integrated recessed self-tacker track for an 88% jib. There is an option for coach roof top longitudinal Genoa tracks and two dedicated Genoa sheet winches on top of the cockpit backrest coamings, enabling the Genoa size to go up to 106% for improved light wind performance. There will be plenty of natural light and ventilation throughout the entire accommodation. The interior of the X4⁰ is designed to maximise the space available, creating a functional, safe and stylish user experience below deck. Once again, the interior design will have Danish design flair and carpentry at its very best. The craftsmanship and detailing will be of a very high standard, being both traditional but with a modern appearance. The wooden veneer will be Nordic Oak as standard, with other options on offer. The two cabin layout has a head compartment with separate shower compartment and features a forward-facing navigation station with full length sofa. The three cabin layout has an innovative aft facing chart table that can be neatly stowed out of the way when not in use. The three cabin layout is available from Spring 2020. The X4⁰ can sail fast and point high to the wind thanks to its powerful lines, precision moulded composite T keel with a heavy bulb of lead giving a high degree of stability.